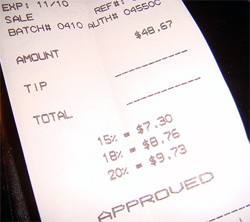 Your gratuity is no longer your own. Earlier this month, a Florida restaurant called the Chicago Pizza and Sports Grille started adding an “automatic gratuity” of 15 percent on every in-house order. In staid, statist Europe, that’s par for the course. In America, you see it on cruise ships, in tony establishments run by celebrity chefs such as Thomas Keller, and in less luxe setting when parties of six or more are involved. But for a lone diner, grabbing lunch at the kind of place that puts an extra helping of vowels at the end of its name to show how much personality it’s got? Say it ain’t so! This is where real America eats. And real America does not deserve a unilaterally applied service charge on its Fried Mozzarella Sticks and Windy City Nachos!